Human Readable Acceptance Test. 把 test case 的步驟用自然語言描述，讓不寫程式的人 (工讀生/PM/老闆) 都能看懂，是 Robot Framework 官方文件的建議寫法，但很多人往往只著重在把程式邏輯翻譯成 test script，這樣固然可以享受到 Robot Framework 的測試報表及 CI 整合等好處，但沒有利用到它全部的優點，比較可惜。以下分享一些 best practices. 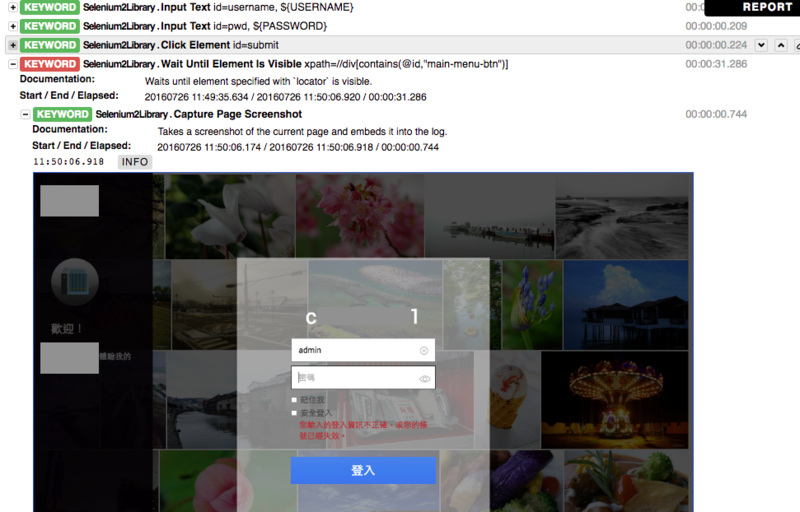 與 Jenkins 的整合似乎就沒有什麼好講的了，就該裝的 plugin (robotframework, virtualenv) 裝一裝，該設定的 dependency 設一設。我目前做的事情是把一些手動測項改寫成 script，導入 Robot Framework 由 Jenkins 驅動。每當待測程式有新版的 build, 就從 git server 上把 script 拉下來, 建一個 virtualenv, 把最新版 build deploy 到機器上做 regression testing. 瀏覽器的部分在寫 script 時是用 Chrome webdriver, Jenkins 上是用 PhantomJS 跑 headless.